Earliest "first freeze", September 11, 1940 (Calendar Day 254). Latest "first freeze", November 7, 1956 (Calendar Day 311). Year 2010, "first freeze", October 3 (Calendar Day 276). 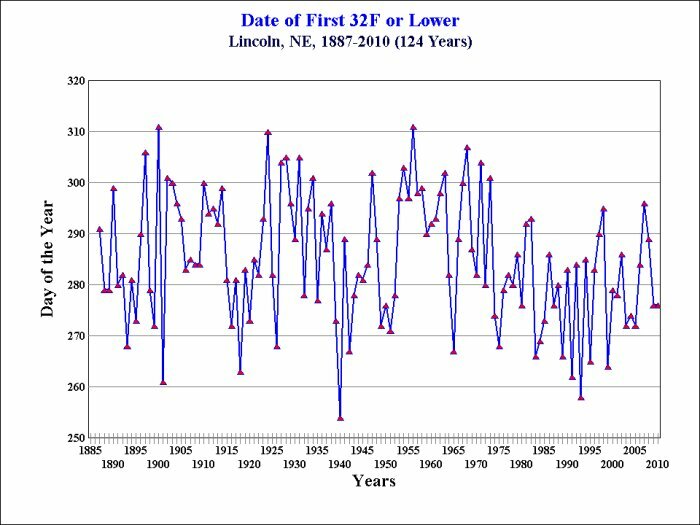 124-year, 1887-2010, average "first freeze", October 12 (Calendar Day 285). Standard 30-year Normal, 1971-2000, average "first freeze", October 6 (Calendar Day 279). All of the above data are the Official National Weather Service data for Lincoln, NE.